OMAHA, Neb. (INS) -- Harmon/Kardon 330C, the vintage stereo receiver deep into a second career as a monitor amp in a home production studio in this Midwestern metropolis, died in a cloud of ozone Saturday, with its right channel humming and the room stinking of toasted electronic components. 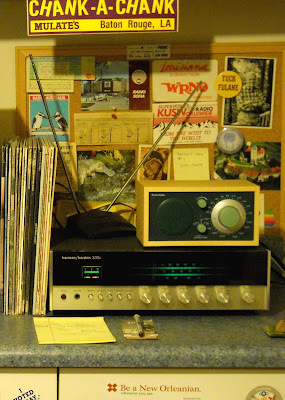 Harmon/Kardon 330C was 36 years old. "Well, you had to figure this would happen sooner or later, using an old, second-hand receiver hours on end every day," said 3 Chords & the Truth host Mighty Favog. "I can't get mad about it; I think I got more than my $35 worth out of it over the past few years." The dead receiver will be interred later in the week somewhere in a basement closet and will be exhumed for spare parts at a later date. In a related development Saturday, 3 Chords & the Truth management announced that Crown 75-A -- a broadcast-industry standard monitor amplifier -- has been purchased as Harmon/Kardon's successor. Favog said it was time to call on pro equipment to do a real studio amp's job. "Crown is the Cadillac of monitor amps," the aging program host slurred. "Those things were (unintelligible) built to go 24/7 in radio air studios, so it ought to (unintelligible) work here with no . . . problem." The new 75-A, which Crown is discontinuing after decades of pro-audio popularity, was obtained from Broadcast Supply Worldwide for $399 -- a $622 discount from the list price as the merchant closes out its stock. Favog, somewhat distracted by the absence of Early Times from his coffee, added that he wanted to pay tribute to Harmon/Kardon for kicking the bucket at such an opportune moment. Crown 75-A is slated to begin its studio duties sometime during the next two weeks.